Not just about old houses (although we do know old houses very well), Vintage is really about creating all kinds of custom kitchens, bathrooms and other cabinetry installations that work very well for the people that use them, and look great in the homes they are installed in. The styles may vary, but these projects share a track record of long-lasting value thanks to both the quality of the cabinetry itself and the longevity of well thought out design. Vintage Kitchens was established in 1995, and in 1997 we moved into our current showroom. 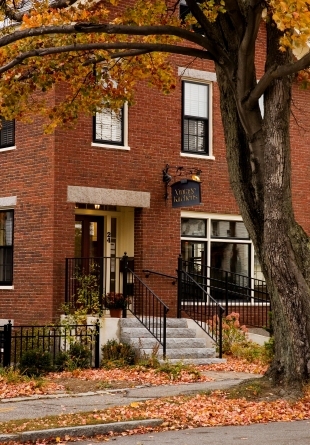 It is located in an 1850's brick house at 24 South Street in Concord, NH. If you share our interest in old house history, click here for a glimpse into the past life of our showroom building; it was once the home of vaudeville stars! Susan Booth, Owner and principle designer. Steve has worked in construction and cabinet-making for 35 years. He is an excellent resource for questions relating to cabinet installation, as well as any technical issues that relate to your kitchen. He also might be the one to come out to your kitchen in the event you need any service or adjustments to your cabinetry after your kitchen is installed – even if these issues come up 5-10-15 years later!